About the middle of August the phone wasn't working. We put in a request for a service call but then later on we had phone service again so we cancelled the service call. What a cascade that set in motion. They cancelled our phone service, then after a couple of REALLY long calls to BELL we got the service back and eventually got our old number back. Then somewhere in the system something noticed the phone number had changed so our Internet service was cancelled. More phone calls, are you getting the picture? Meanwhile our wireless set-up wasn't working but it couldn't be dealt with until the Internet was back up and running. I think/hope we are back up and running. I am worn out dealing with this. Meanwhile I realized I let four Scrapbag quilts out of the house without taking their pictures. I did take three Project Linus quilts to Kincardine for quilt guild this month.Guild is getting back up and getting ready for our show next month. My younger grandson asked me to make him a soft quilt. Translation, he wants a quilt with Minkee on the back. 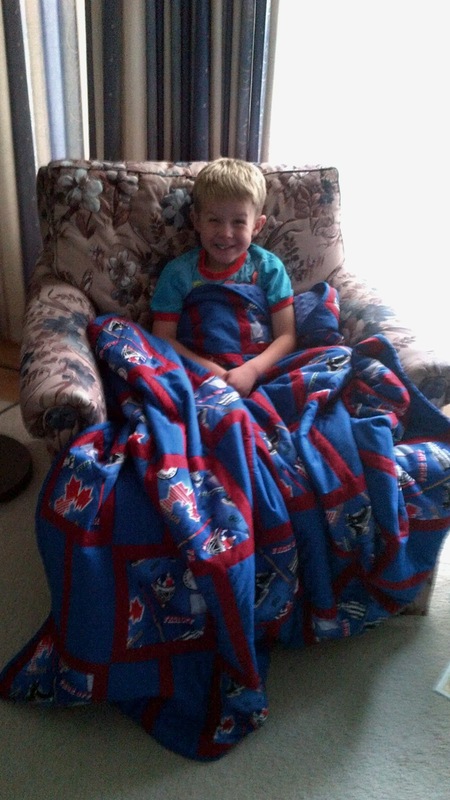 So I asked him what size quilt he wanted and he replied he wanted "a Dylan sized quilt". I loved that response. Checking with his Mom she wants a quilt for his bed so I have been working on that instead of net surfing. I have managed to stitch 860" of binding for my September report in to CQA for their Cross Canada binding stitching project. This simple brick quilt has been waiting for a while to get quilted. I managed to get several quilts quilted this week and this one got its binding sewn down too. 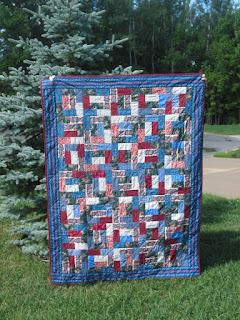 The Canadian Quilters Association is having a fun challenge and it started on September 1st. Members keep track of how many inches of binding they are able to sew and once a month report in to the director at large. Guilds are being encouraged to take on the challenge so the director at large will not have a mailbox crash on reporting day. We are going to see how far across the TransCanada Trail we can stitch. 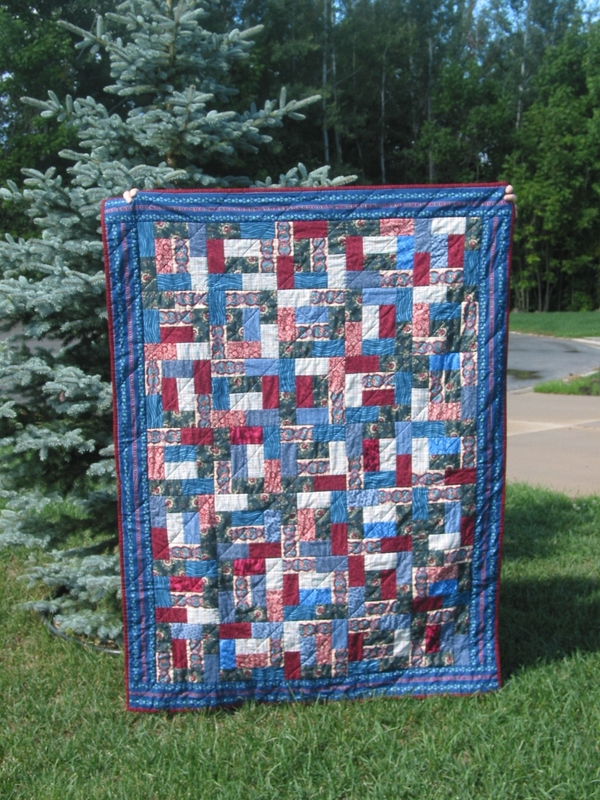 I have completed the binding on two small quilts and this one for a total so far of 368". Imagine how far we can go if all the members particpate!